It’s been several months since I returned from my Tokyo trip, so I thought it was about time I share some of my experience shopping for stationery there. I doubt this is going to be a long series of posts but at the very least I’ll do a couple, starting with my visit to Kakimori. 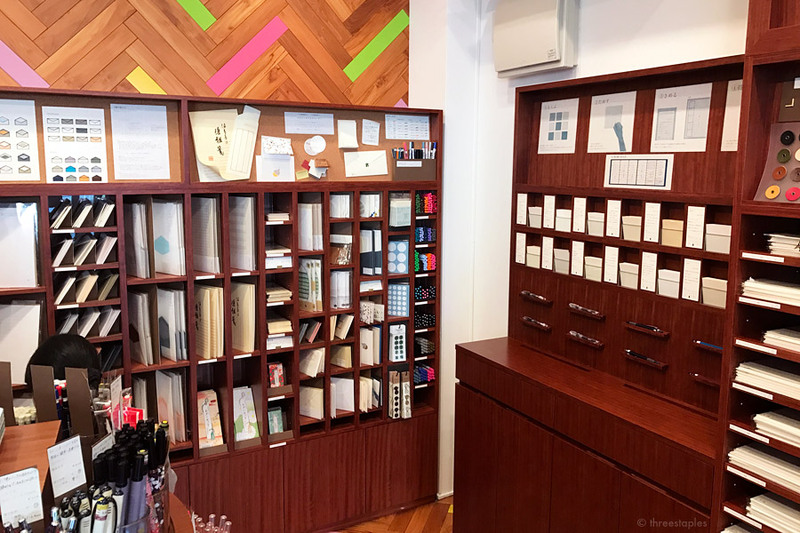 Kakimori is a stationery shop in Tokyo that is well known among stationery enthusiasts for their custom notebook-making service and Ink Stand, their spin-off located next door where you can mix your own fountain pen inks. 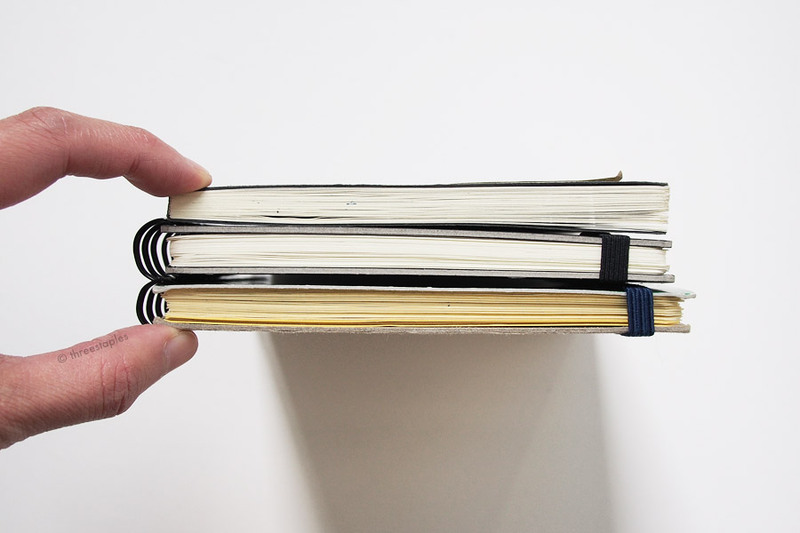 In this post, I’ll focus on Kakimori, with details on my custom notebook making experience, and then I’ll get into Ink Stand in a separate post. Like most of my posts, this will be long and image heavy. The shop was within an easy walking distance from Kuramae Station. Many stationery shops Mr. Three Staples and I visited were inside department stores, but Kakimori was a one-level store right on street level. It was on a main street but M and I found the neighborhood much quieter and relaxed than the touristy areas like Shinjuku or Shibuya. Inside the store was a different story though. We went on a weekday afternoon but it still got quite crowded at times. Definitely popular among locals and foreigners alike. A wall full of pens you can try. There were fountain pens, roller ball pens, ball points, etc, in a wide range of price points. And I loved this store. The space wasn’t that big but it felt comfortable and warm, with lots of wood accents. I wouldn’t say their stock was comprehensive but there was no shortage of stuff to browse: several kinds of pens including fountain pens, pencils, letter sets, notebooks, desk accessories, etc. Just enough for you to test a variety but not too much to be overwhelmed. What’s really neat about this place is that the store layout and displays felt designed for people to explore, to test pens and paper easily before you buy them. One wall was dedicated to pens, one for wooden pencils, one for choosing paper stock for custom notebooks, each section with smart displays, test paper, and writing surface. 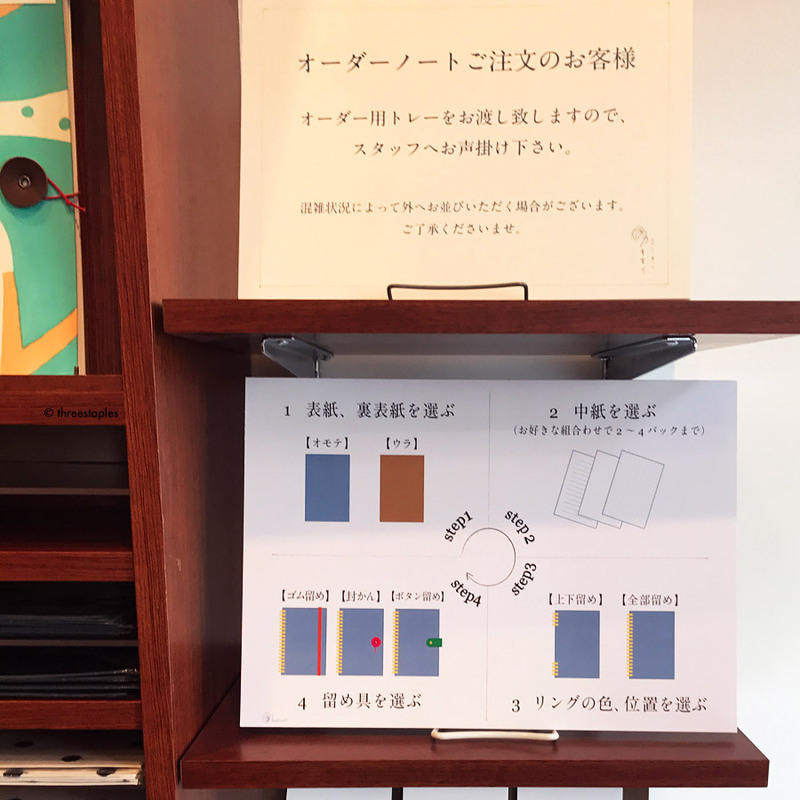 There are other stationery shops that offer samples and have testing corners, but at Kakimori it was clear it was not an afterthought. A small but fantastic pencil section with wooden shelves. There were brands like Mitsubishi, Tombow, Conte à Paris, Caran d’Ache, Staedtler, Faber-Castell, and Stabilo. They’re organized by softness and each cubby has a little slender cup in front for the sample pencil. There was a round table full of novelty pens and pencils, including Field Notes Brand’s Carpenter Pencils and designer Duncan Shotton’s Rainbow Pencils. Corner for letter writing supplies, with envelopes and various accessories like labels, stickers, pens, etc. On the right is where you learn about the different kinds of paper you can choose for your custom notebooks. I had fun trying different pens and pencils, but I spent majority of time and energy making my own custom notebook, which as I mentioned is what Kakimori is known for. When you step in, the whole right side of the store is dedicated for this “order note” service, with shelves filled with different kinds of paper and cover stocks. Again, the selection wasn’t too overwhelming but there was enough variety to make your notebook quite unique. Testing corner for paper that will go into your custom notebook. Each cubby holds sample paper that you can pull out and test with 4 different types of writing tools seen on the bottom: fountain pen, rollerball pen, ball point pen, and woodcase pencil. 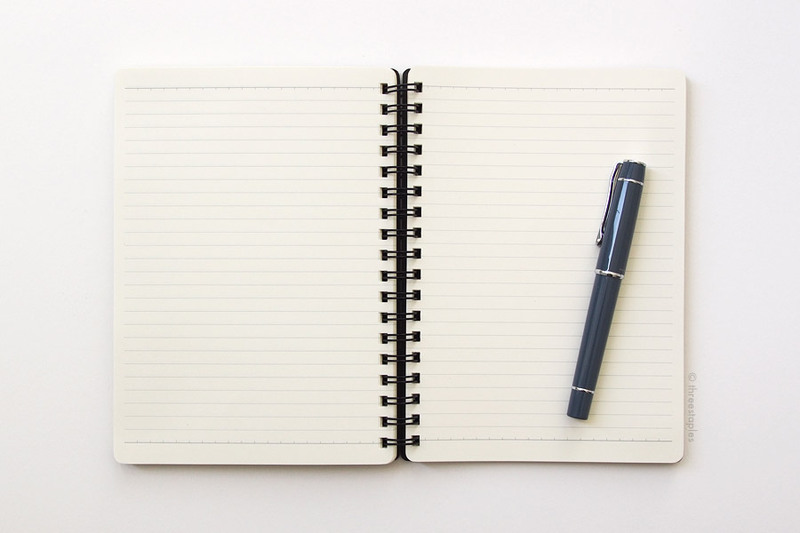 Cropped from this picture, but visible on the previous one, is a writing surface, with two slots where you can discard the sample papers when you are done. Neat. As you can see, there were several types of paper to choose from, and each type had a short explanation next to it on a card, with information on how many sheets there are per pack (they’re sold in prepackaged packs), price per pack, size availability (B5 or B6), ruling, types of writing tools that are best with it, even shelf numbers where you can find the paper. Mostly in Japanese, but it did have helpful keys for each type of writing tool (fountain pen, pen, and pencil): double circle ◎ for best, circle ◯ for good, triangle △ for so-so and ✕ for not good. They also had plenty of other types of paper, like “comic” paper that’s good with pencils, kraft paper suitable for scrapbooking, and even watercolor paper. Which means this custom service is not limited to just notebooks for writing but also for albums and sketchbooks... Oh the possibilities! 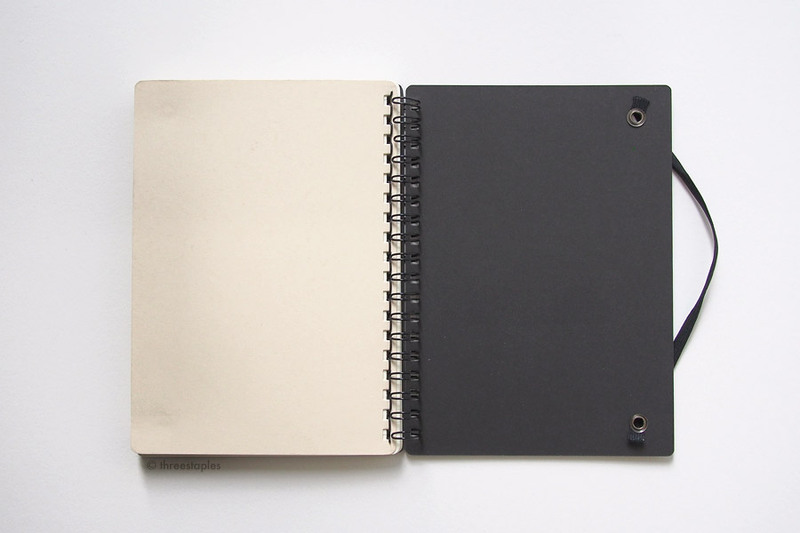 This is definitely when you start thinking about which orientation your notebook will be (portrait or landscape) and size (B5 or B6). 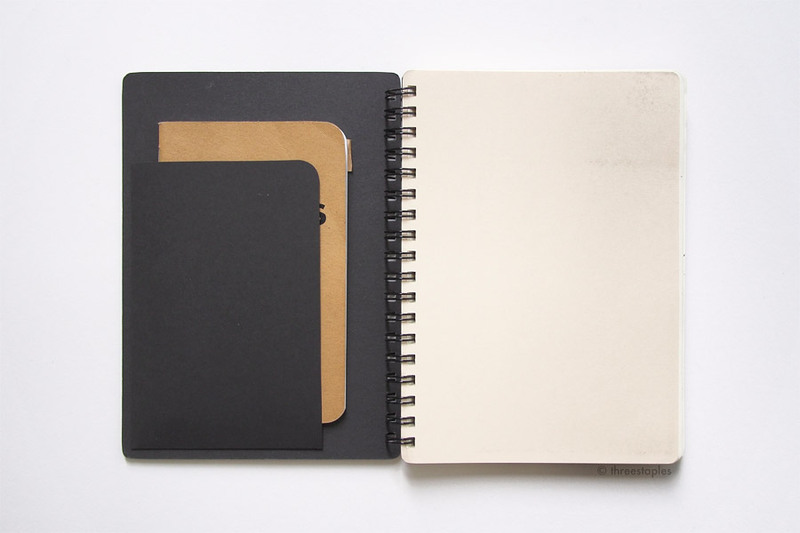 Decorative covers and sample notebooks on the top. 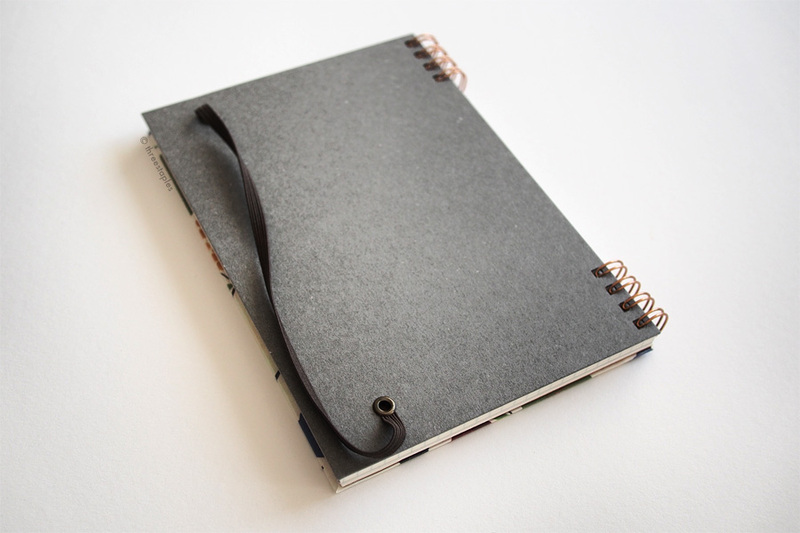 How to make your custom notebook in 4 steps. My custom Kakimori notebook in size B6: inside are two pouches (envelopes), un-dated monthly calendar pages for one year, one letterpress sheet with 2017 calendar and then 3 (I think) packs of bank paper in graph grid. Next you decide on the type of spiral you want (one long, or two shorter spirals), and the type of fastener (elastic band, leather snap button, or button & string), all in a variety of colors. It helped that there were several sample notebooks out on display. With the leather snap button, you could either get it in plain or in the pen-holder type, which I think had an elastic band sewed on the inside, if my memory serves me right. You can also get your name printed on the cover but that apparently takes about 3 weeks. By the way, with all these parts, you just note your choices in your head. The actual parts are behind the counter where they assemble the notebook, so you don’t have to have them ready in your tray like you do with the body paper and covers. When we were there, it was quite busy, with several shop assistants doing the assembly by the windows, but I didn’t have to wait that long for mine. The friendly guy who took my order went through all the details and confirmed my choices, down to the direction the flap on the envelope was going to face, and then went off to work. (Actually, I don’t remember whether I paid for the notebook at this point or after the assembly.) I was worried that I’d picked too many pages and that my notebook would be too thick for the spiral but he assured me that it’d be okay. I chose “bank paper” with graph grid (5 mm). The grid is light blue, and there’s a tiny “Kakimori” logo on each page in the same blue color. A stiff dark brown cardboard was included in the back. Probably to be used as a pencil board or a blotter? I should mention, it would help to have all your packs of paper in the correct order, and everything double checked before you approach the counter, because I intended to have 3 identical packs of “bank paper” but somehow handed in 2 packs, plus 1 pack of Tomoe River paper. They were all graph grid and looked really similar in the clear packaging. I think the guy realized this after my notebook was assembled and apologized for not double checking with me earlier. I thought it was my fault! 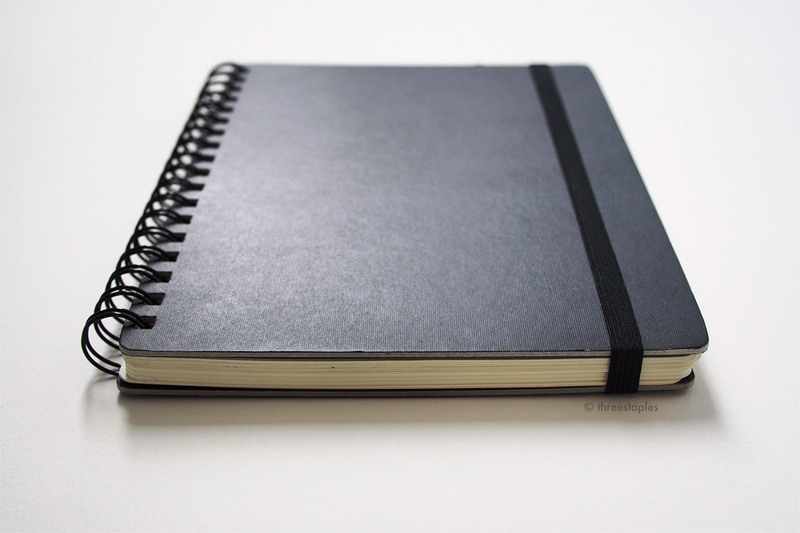 Thankfully it was a quick fix and in no time I had my very first custom notebook in my hand. A side note on communication. Most of the signage was in Japanese but I think you could get by without knowing the language. You’re shopping for something physical and they had plenty of examples that you can refer to, even at the ordering counter. Plus the shop seemed accommodating enough to foreigners, with at least one clerk who could speak English. I think my notebook came out to be about $25 USD. Their website says it can range from 1000 yen to 3500 yen in most cases (about $9–32 USD at current exchange rate), depending on what kind of paper, cover, and accessories you choose. If you’re a local, you can even reuse the covers by having them take the used pages out and replace them with new paper of your choice (you’ll have to pay for the replenishment, of course, and for the service). Overall, it was not cheap but worth every penny for the uniqueness and the experience, in my opinion. And what a wonderful experience it was. 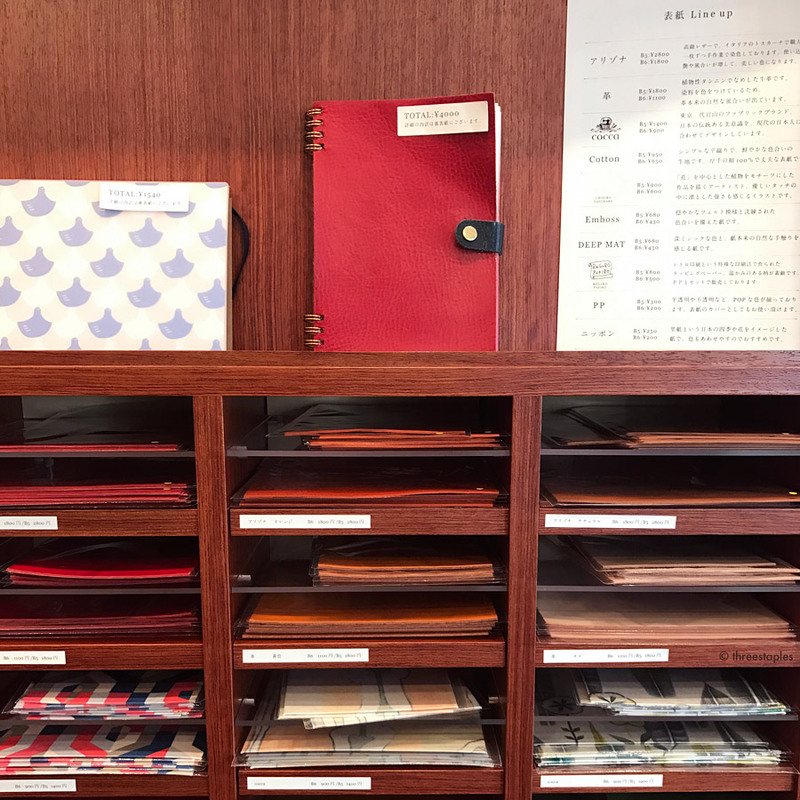 I highly recommend Kakimori as part of your stationery shopping itinerary in Tokyo (but avoid weekends, I’m told). To those who are seriously planning to go, I hope this post was useful. It’s one of those stores that you wish were in your neighborhood, not half way across the world. But I’m really grateful that I got to go and bring home something unique, made even more special by the fact that it’s from a place far, far away. I didn’t really have a specific plan before making the notebook, other than to make it versatile yet different enough from what I already have. And I still don’t know exactly what I’ll use it for, but you bet it’s going to be for something special. Kakimori even had a free illustrated map of their neighborhood. Charming! If I ever go back to Tokyo, there’s no question I would go back to Kakimori and explore the Kuramae neighborhood some more while at it. I learned that it has long been an area for handicraft businesses and that in recently years has been attracting the younger generation of artisans. Indeed, on a short walk around the neighborhood, we passed by several interesting stores, including a textile store called Maito and M+, a leather accessories store. And of course, right next to Kakimori was Ink Stand, where we made our own fountain pen ink colors, and I'll write about that in my next post.